Every year the best roller derby teams in the world come together in one spot to contend for the Hydra, the championship trophy of the Women’s Flat Track Derby Association (WFTDA). I spent all of last weekend with other roller derby fans crammed into Milwaukee’s U.S. Cellular Arena watching the elite teams of the sport raise the game to a whole new level while competing for this coveted trophy. Sitting in the audience looking around at the thousands of others who’d made the trek from around the world to be there, I was amazed to see how far the sport has grown in such a short period of time. From the cameras and media lining trackside and catching all the action live to the elite-level athletes playing the game at an unimaginable level on the track in front of me, the sport is reaching new heights. Because of its inclusiveness and grassroots, the sport of roller derby is by far the fastest growing sport for women in the world. Toronto Roller Derby is the third oldest league in Canada. At present there are an estimated 200 Canadian leagues and about 50 in Ontario alone. Just ten years ago, the game existed only in the United States but is now played in nearly 30 countries. This 2013 season was the year that Toronto Roller Derby made a huge splash in the international roller derby community. Our all-star team, CN Power, had high hopes to earn a spot in the Divisional II WFTDA tournament. WFTDA is the Women’s Flat Track Derby Association, our non-profit international governing body. Not only did Toronto’s all stars exceed their goals by winning a few key late-season games to place 39th, they qualified for Division I playoffs! They flew out to Salem Oregon to play Sacramento, Boston, Atlanta, and Melbourne. They were international sweethearts and put Toronto on the derby map for all to see. While we didn’t qualify for the championship tournament in Milwaukee, this success and exposure has created a lot of opportunity and momentum for Toronto Roller Derby. This year’s WFTDA Championships in Milwaukee were the biggest yet. Here is a preview of the tournament and its teams written by Canadian Roller Derby Sports Writer, The Derby Nerd. I’ve been to every WFTDA Championship since 2010 in Chicago. Denver hosted 2011 and Atlanta hosted 2012. In each of these three previous Championships, there was a similar theme: one or two teams displayed a huge disparity in elite derby skill. This year, things changed. We saw the top five bring their top skill level and exceed all expectations, closing the disparity and demonstrating that the world is catching up to the top teams. The final, between New York City’s Gotham Girls and Austin’s Texacutioners, was one of the greatest games ever played. Here is the Derby Nerd’s recap on how it all went down. I have been reflecting on how far we’ve come, as a league, as a province, as a country, and as a women’s sport. It is a privilege to be involved in the development of a sport in its infancy: both on and off the track. As all leagues follow a DIY model, the skaters you see on the track are the same ones who are the Executive, ticket sellers, promoters, training, bout setup, and BoD members of the league. We do it all! I’m taking all this inspiration I’ve gained from the 2013 WFTDA Champs and bottling it to sip it slowly in preparation for next season. Our travel team tryouts have set our CN Power (A team) and Bay Street Bruisers (B team) rosters and our league draft is this weekend where our four home teams top up to 20 skaters and train hard for our January 2014 season start. If you’ve never been, I encourage you to throw away all preconceptions from the roller derby of the 60s and 70s and even the roller derby of several years ago and find your local league (you definitely have one and you may not have even known!). This sport is evolving fast. Starting as a fun, cheeky, feminist-focused revival in the early 2000s, the game has reached a whole new level. Skaters have become elite athletes. Leagues have multiple levels of play that encourage competitiveness while still remaining inclusive for skaters of all skill levels and backgrounds. You are going to want to see Toronto Roller Derby in its 2014 season. Get tickets here and watch for our schedule here! Season passes make great holiday gifts! Bio: Jan Dawson has been skating with Toronto Roller Derby since 2008. 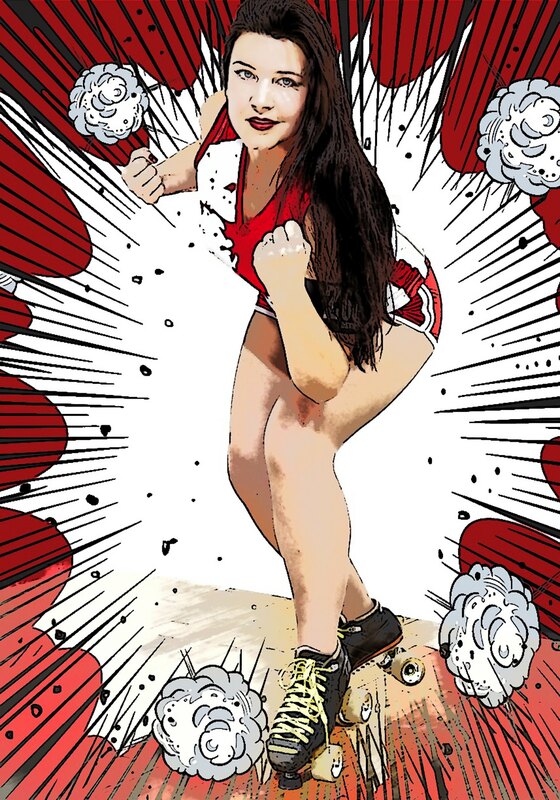 She skates for the Death Track Dolls, one of four Toronto home teams and was formerly Co-Captain and one of the creators of Toronto’s B Travel Team, the Bay Street Bruisers. Alongside various other leadership roles in the league, Dawson is Past-VP of Toronto Roller Derby, serving three seasons in total.